China Tower (H) is part of Technology Hardware and Equip. business, which is part of Technology industry. China Tower (H) is a company from China, and his stocks are publicly traded. China Tower (H) paid a total dividend of 0 million HKD last year, for a market value of 260,493 millions (Market Cap 51,838 millions). Dividend per share of China Tower (H) is 0.00 HKD, and his stock market price 1.48 HKD. According to the chart below where dividend yield is displayed, China Tower (H), has a dividend yield of 0%, amount in contrast with the positive dividend offered by both the market average and companies from China, Technology industry, and Technology Hardware and Equip. sector. This lack of dividends of China Tower (H) might harm the evolution of share price if the company is not clearly expanding his business. 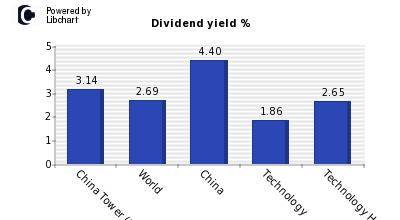 In addition, you should compare China Tower (H) dividend yield with other Technology Hardware and Equip. companies or firms from China. About the ability of China Tower (H) to maintain his current dividend of HKD 0.00 per share, an amount that accounts for 0.00%, we should study its payout ratio both on earnings and on cash-flows (see chart below). China Tower (H) payout on ernings is currently 0.00%, which is lower than the market average and companies in his industry and sector. The following figure shows payout ratios over earnings and cashflow of China Tower (H), compared againt world market average, China companies, Technology industry and Technology Hardware and Equip. sector companies. Finally, last moth China Tower (H) showed a return of 27.60% compared to a worldwide -5.60% average, and a -7.11% of Technology firms. Over the last year, the company obtained a 0.00% versus a worldwide performance of a -11.41%. More detailed information can be seen in the following graph for China and Technology Hardware and Equip. firms. China Traditional Ch. China. Health Care. China Travel Interna. Hong-Kong. Consumer Services. China Unicom Hong Ko. China. Telecommunications. China Vanke (H). China. Financials. China Yurun Food Gro. China. Consumer Goods. China Zhongwang Hold. China. Basic Materials. China Telecom H. China. Telecommunications. China Steel. Taiwan. Basic Materials. China State Con (RC). China. Industrials. China South City Hol. China. Industrials. China Shipping H. China. Industrials.